CIAT’s Genetic Resources Program conserves large collections of beans and tropical forages as seed and whole plants, and cassava in vitro and as small plants. Regeneration of beans and forages is undertaken by a specialised production group that makes use of advanced facilities to produce suitable quantities of high-quality seed that maintains the genetic integrity of the original accession. 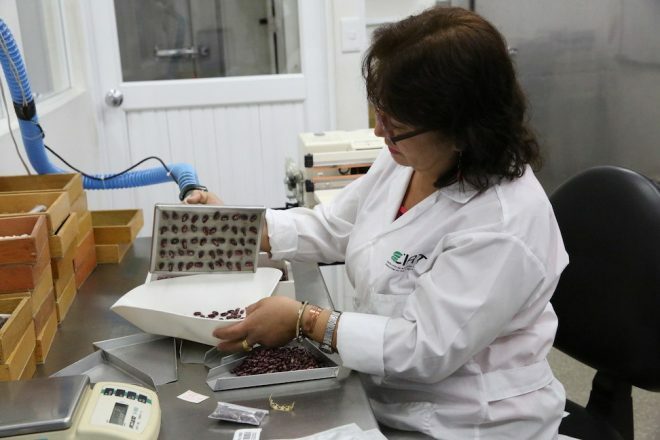 The Genetic Resources Program is collaborating with researchers in the CGIAR HarvestPlus program to select bean varieties that offer increased iron for better nutrition. It is also working to find tolerance to cassava brown streak virus and with the Livestock-Plus program of CGIAR to improve Brachiaria as a fodder plant. The Germplasm Health Unit has a staff of nine. For beans and forages, the GHU examines seed for the presence of pathogens and pests, while for cassava, samples of which are generally produced in vitro, the focus is on virus indexing. Key staff: Luis G. Santos, Coordinator of seed conservation; Ericson Aranzales, Coordinator of tissue culture.